All Chula Vista homes currently listed for sale in Chula Vista as of 04/19/2019 are shown below. You can change the search criteria at any time by pressing the 'Change Search' button below. "Discretely nestled in one of the most serene sections of the Chula Vista/Bonita area, this 13-bedroom, 13.5 bathroom property is a unique find. Almost completely surrounded by trees and neighboring properties, the main driveway to this magnificent 14,560-square-foot estate (nearly one acre) peeks out to Hilltop Drive, while maintaining the rest of the property secluded from plain view. Granny Flat Included. 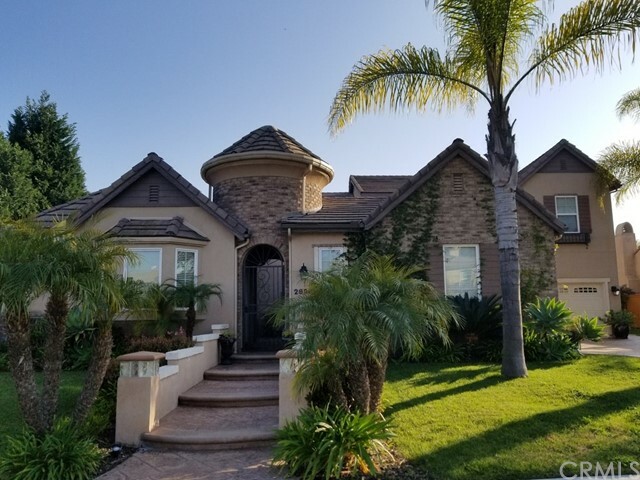 See supplemental and attachments Neighborhoods: Pepper Tree Area Architectural Style: Custom Built View: Custom Built Complex Features: ,,,,, Equipment: Dryer,Pool/Spa/Equipment, Range/Oven, Washer Other Fees: 0 Sewer: Sewer Connected Topography: LL Guest House Est. SQFT: 900"
"Modernized mediterranean custom estate located within The Gates @ Eastlake... Enjoy 180 degree sunset views illuminating Otay lake & hillside while perfecting your golf game at the PGA pro designed putting green. Soaring ceilings, elegant iron railings, stone & wood flooring mixed w/ contempo finishes deliver a timeless design. Enjoy chef s kitchen w/ high end appliances, butcher block countertops & heated floors. Equipped w/ premium home audio, smart home tech, solar system to power the entire home. Neighborhoods: The Gates at Eastlake Complex Features: ,,,,,, Equipment: Dryer,Garage Door Opener, Range/Oven, Vacuum/Central, Washer, Water Filtration Other Fees: 0 Sewer: Sewer Connected Topography: LL,"
"Wow! Secluded luxury and entertainer's dream! This home has been meticulously upgraded. Both main house and detached guest house / granny flat / ADU are beautifully executed with modern, rustic, industrial finishes. Open concept living with clean lines that welcome peaceful inviting spaces. Both homes feature the highest quality air and water purification systems. Hand sculpted oak hardwood floors. Hardwired, monitored security and surveillance system. Gorgeous outdoor spaces. A must see! Neighborhoods: Rolling Hills Ranch Equipment: Fire Sprinklers,Garage Door Opener, Range/Oven Other Fees: 0 Sewer: Sewer Connected Topography: ,LL,RSLP,GSL"
"WELCOME TO YOUR DREAM HOME!! This Stunning Rancho Del Rey property HAS IT ALL! Nestled at the top of the canyon, with nothing behind you but breathtaking Ocean & Downtown San Diego City Views, you will feel like you're on vacation at a Magnificent Resort! Life doesn't get much better than this! Located just a little over a mile from I805, you can be on the freeway in a flash! Walking distance to nearby parks, tennis courts, and highly rated schools. Don't miss your Opportunity to own this INCREDIBLE HOME! Neighborhoods: Rancho Del Rey Equipment: Garage Door Opener,Pool/Spa/Equipment, Satellite Dish Other Fees: 0 Sewer: Public Sewer Topography: LL"
"Luxurious home situated in San Miguel Ranch. This amazing home has exotic wood floors in the spacious breakfast room & family room. Exquisite artesian crafted handmade cabana accordion doors open to a custom designed backyard that includes a lovely water feature, an 15x11 spa, lava rock fire bowls, aqua glass in the fire pit & an 11x13 outdoor patio structure that provide you with fabulous views. Gorgeous master bedroom features a 20x13 retreat & balcony to enjoy the beautiful views. (see supplement) Neighborhoods: San Miguel Ranch Other Fees: 0 Sewer: Sewer Connected Topography: LL"
"GORGEOUS EXECUTIVE STYLE HOME IN PRESTIGIOUS BELLA LAGO NEIGHBORHOOD WITH VIEW OF THE LAKE AND MOUNTAINS. SITUATED IN QUIET CUL-DE-SAC. THIS STUNNING HOME HAS IT ALL. IMMACULATE & READY FOR YOUR OCCUPANCY. FEATURES: 2 STORY, 6 BEDROOM & 6.5 BATHS, CUSTOM BUILT PROFESSIONAL LARGE THEATER ROOM, POOL, WATERFALL, JACUZZI, OUTDOOR BBQ AREA, CUSTOM (DARK WOOD). OPEN KITCHEN WITH 2 ISLANDS/STAINLESS STEAL TOP OF THE LINE APPLIANCES, SEPARATE FORMAL DINING ROOM. VERY PRIVATE, NO NEIGHBORS BEHIND. SEE ATTACHMENT. Neighborhoods: BELLA LAGO Equipment: Fire Sprinklers,Garage Door Opener,Pool/Spa/Equipment, Range/Oven, Washer Other Fees: 0 Sewer: Sewer Connected Topography: LL"
"Spectacular Rolling Hills Ranch Retreat with 2 Separate entry Guest Quarters! $100k+ Pool and spa. Gorgeous Detached Guest House, and separate entry maid quarters. Huge first Level Master Suite, expansive Master Bath, 2 Large walk- in closets, oversized tub and Shower for Two. Highly upgraded 2006 home, 4536 sf including Guest House- Lot size 12,761 ft. Mountain and open space views! No neighbors behind! 5-bed/5.5-bath, 2-story professionally decorated house with 9 ft ceilings throughout and 3 sets of double french doors. There are 2 Large upstairs Bedrooms with 2 full baths and a big family room for the kids. Main level has a 19ft. ceiling in the living room with fireplace and built-in Cabinets, office and large formal dining room with wine cellar. Upgraded ceiling fans in every room. Upgraded kitchen with custom cabinetry, granite countertops, stainless steel appliances, and double ovens. Italian Onyx floor tile throughout the house, private gated front courtyard. Large Solar heated pool, swim up bar, water fall, 6 person spa, a built in barbecue area and outdoor fireplace...a true family and entertainer's delight! A Fully Detached 550 sq ft professionally decorated guest house with a full kitchen, full bath and private entry. Rent it out or use it for extended family. This house is in turn key condition, and move in ready. A community 5-star resort style clubhouse, 2 pools and spa. Quiet neighborhood and low traffic street." "Turn key beautiful corner lot property with entertaining casita with kitchenette and full bathroom built in BBQ with 2 grills,great for entertaining. This property has it all, solar panels, granite counters, ss appliances, full bedroom and bathroom downstairs, butlers pantry, wet bar, wired for sound and telecom, piped for central vacuum, original owners have take great care of it, great yard, fire pit, 3 car garage, 5-6 car driveway and sideways, 3 wine and beer fridges, office, 3 fireplaces and more. Neighborhoods: Rolling Hills, Bella Lago Equipment: Fire Sprinklers,Garage Door Opener Other Fees: 0 Sewer: Sewer Connected Topography: LL"
"New construction is ready approximately December 2019. Gorgeous two story, large kitchen with breakfast bar Island, butler s pantry, stone counter-tops and stainless steel appliances. Great room w/Covered patio and fireplace, spacious bonus room, master bedroom suite w/covered deck & spa like master bath, laundry room, expanded 3 car garage , solar system and more. See supplement. Neighborhoods: Vista Del Cielo at Bella Lago Equipment: Garage Door Opener, Range/Oven Other Fees: 0 Sewer: Sewer Connected Topography: LL"
"Luxury Estate! This beautiful home boasts a open concept design, which flows into a spacious are for entertaining guest while still cozy enough to call home. Every amenity was carefully thought out and installed. Complete with a large outdoor patio for summer parties or lounging and soaking up the sun pool side. A must see in the desirable community of Rolling Hills Ranch, away from the main roads but close enough to the city that commuting is not an issue. Neighborhoods: Bella Largo Equipment: Pool/Spa/Equipment Other Fees: 0 Sewer: Sewer Connected Topography: LL"
"Privacy is the Key word, arrive to your own little private Estate, Surrounded by a concrete wall, with a Private gate, that leads you into the home you've been looking for. Home has been upgraded with beautiful flooring, custom kitchen with Stainless Steel appliances fit for the most demanding Chef. House has a complete bedroom and bathroom on the first floor. Get ready to enjoy your summer nights amidst this Tropical Oasis. Don't Miss out this is a Must See!! Neighborhoods: Bella Lago Equipment: Garage Door Opener Other Fees: 0 Sewer: Sewer Connected Topography: LL"
"New construction is ready approximately Nov/Dec 2019. Dream come true, as you marvel at the spaciousness, luxury & sophistication of this extraordinary home. Single story living, open floor plan, dramatic large scale windows, indoor-outdoor living amenities, covered front porch w/courtyard, large kitchen w/dual Islands, great room w/covered patio & fireplace, dining room w/courtyard access, master bedroom suite w/dual walk in closets, & spa like master bathroom. Expanded 2 car garage. See supplement. Neighborhoods: Vista Del Cielo at Bella Lago Equipment: Garage Door Opener, Range/Oven Other Fees: 0 Sewer: Sewer Connected Topography: LL"
"VIEW POOL NO NEIGHBORS BEHIND! Incredibly stunning remodel in prestigious Rancho Del Rey with canyon view and pool. Truly a entertainers dream come true with outdoor kitchen under detached covered cabana, oversize island, new BBQ, fan & lighting and outdoor full bath. HUGE pool/spa w/waterfall, sunken area w/swim up bar. Exquisite finishes and upgrades. 2 full bedrooms, 1.5 baths, office and sauna downstairs. 2 full master bedrooms and baths both w/large walk in closets. Located on a cul-de-sac & NO HOA! Neighborhoods: Rancho Del Rey Other Fees: 0 Sewer: Sewer Connected Topography: LL"
"New construction ready approximately December 2019. Single story living. Marvel at the spaciousness, luxury & sophistication of this extraordinary home. Covered front porch w/courtyard, single story living, large kitchen w/breakfast bar Island, covered patio & fireplace, dining room with courtyard access, lounge, master bedroom with spa like master bath, smart space laundry room, split 3 car garage, multi-generational suite w/living space, private bedroom bath & entry door. Please see supplement. Neighborhoods: Vista Del Cielo at Bella Lago Equipment: Garage Door Opener, Range/Oven Other Fees: 0 Sewer: Sewer Connected Topography: LL"
"Great opportunity to own this single level home in the highly desirable community of Rolling Hills Ranch in Chula Vista!! This property shows true pride of ownership and is highly upgraded featuring wood flooring, granite counters, stainless appliances, plantation shutters, owned solar for additional savings, huge living room with fireplace, and a 3 car garage. Amazing yard that would be great for entertaining with your enormous patio and panoramic views!! Wont last long!! Neighborhoods: Rolling Hills Ranch Equipment: Garage Door Opener Other Fees: 0 Sewer: Sewer Connected Topography: LL"
"WOW- HUGE FLAT CORNER LOT. INCREDIBLE ROOM FOR GREAT PARTIES. HUGE SALT WATER PEBBLE TECH POOL. SPA & WATER FALL. WONDERFUL COURT YARD ENTRY. UPGRADED ENTRY. LOVELY LANDSCAPING. OUTDOOR KITCHEN WITH COOL OUTSIDE SEATING. WONDERFUL FLOOR PLAN. 2 BEDROOMS (ONE USED AS AN OFFICE) DOWNSTAIRS. UPSTAIRS FEATURES THEATRE AREA. 4 BEDROOMS. HUGE MASTER WITH FIREPLACE. SEPARATE RETREAT AREA PERFECT FOR WORK OUT AREA. PRIVATE BALCONY. HUGE WALK-INS. LOW HOA. ENJOY THE BEAUTIFUL WOODS & CREEKSIDE CLUB HOUSE. Neighborhoods: Eastlake Woods Other Fees: 0 Sewer: Sewer Connected Topography: LL"
"BEAUTIFUL PAMPLONA HOME LOCATED AT THE END OF CUL-DE-SAC. ACTUAL SQUARE FOOTAGE OF 4,972, MAIN HOUSE 3,952, DETACHED CASITA/CABANA 1,020 (WITH BLDG PERMIT).USED AS FAMILY ROOM/GAME ROOM/GYM/DRY HEAT SAUNA ROOM. SPARKLING POOL/SPA WITH WATER FEATURE. LARGE 1/3RD ACRE LOT WITH RV/BOAT PARKING, BASKETBALL COURT, FULL PERIMETER BLOCK WALL WITH SECURE AUTOMATIC GATE. MAIN HOUSE HAS FULL BED/BATH DOWNSTAIRS AND 4 BEDS/3 FULL BATHS UPSTAIRS. Neighborhoods: RANCHO DEL REY Equipment: Garage Door Opener,Pool/Spa/Equipment Other Fees: 0 Sewer: Sewer Connected, Public Sewer Topography: LL Guest House Est. SQFT: 1020"
"-GREAT VIEW , ENJOY FIREWORK AND CORONADO ISLAND VIEW FROM PRIVATE MASTER BALCONY AREA.THIS CUSTOMIZED HOUSE FEATURES OVER $250,000 IN UPGRADES,STAINED GLASS THROUGHOUT-PRIVATE CASITA 250 SQ FT.NOT INCLUDED IN SQ FT.BUT PERMITTED) FOUNTAIN IN COURTYARD INCREDIBLE BACKYARD FEATURING EXTENSIVE STAMPED CONCRETE.FRESHLY PAINTED INTERIOR AND EXTERIOR. ALL ROOMS HAD CROWN MOLDING INSTALLED.PLAY GROUND AND FRUIT TREE AT SIDES LARGE COVERED PATIO-CUSTOM POOL W/RAISED SPA-WATERFALL-S . BUILT IN BBQ IN GAZEBO. Neighborhoods: RANCHO DEL Rey Equipment: Dryer Other Fees: 0 Sewer: Sewer Available, Sewer Connected Topography: ,GSL Guest House Est. SQFT: 250"
"Indoor - Outdoor living amenities to Express Your Life Style. Pool, Spa & Swim Jet. Richard Marshal solid wood flooring, tile utility area & baths. bedrooms carpeted. Office with built-in desk cabinetry. The galley style kitchen offers casual dining, built-in desk and walk in pantry. Beautiful owners suite has fireplace, huge walk-in closet and dressing area. Bedrooms 2 & 3 have the hall bath between them. Then the 4th bedroom has walk in closet and full bath. 3A Garage with Charging Station Neighborhoods: Rolling Hills Ranch Equipment: Pool/Spa/Equipment Other Fees: 136.56 Sewer: Public Sewer"
"HUGE PRICE REDUCTION! Former MODEL HOME. This 4-bed/4.5-bath, 2-story highly upgraded house offers a huge master bedroom downstairs, 2 bedrooms & a playroom upstairs, high ceiling living room, 1 office downstairs and formal dining room with private wine cellar, a separate guest suite with a full bathroom. Upgraded kitchen with custom cabinetry, slab granite countertop, and built-in refrigerator. Gated front courtyard & large brick-paved backyard. The community has a 5-star resort style clubhouse & pool. Neighborhoods: Rolling Hills Ranch Complex Features: ,,,, Equipment: Garage Door Opener Other Fees: 0 Sewer: Sewer Connected Topography: LL"
"Nestled on the quietest cul de sac in San Miguel Ranch sits a truly exceptional 5 bed/3 bath plus bonus room home on an amazing acre lot overlooking the nature reserve. Panoramic views, ocean breeze, and amazing sunsets from an unparalleled backyard resort. This tropical oasis boasts exotic palms, hardscape, a gas fire pit, phenomenal salt-water pool and spa, outdoor kitchen that includes two refrigerators, a kegerator, built-in bbq, and more! The home features two downstairs bedrooms and a full bath Neighborhoods: San Miguel Ranch Other Fees: 0 Sewer: Sewer Connected Topography: LL"
"Most prestigious and desired communities within the South Bay area. Gated community. Lot is in a private quiet location. Home has been recently remodeled and upgraded. Light, bright, and nice. Has a bedroom down. Come add your landscaping touches. Neighborhoods: Rancho Del Rey Estates Other Fees: 0 Sewer: Sewer Connected Topography: LL,GSL"
"VIEW VIEW VIEW. CUL-DE-SAC. LOW MELLO-ROOS. NO HOA. DRAMATIC ENTRANCE. DOUBLE DOOR ENTRY. DOWNSTAIRS BEDROOM & FULL BATH. LARGE OPEN KITCHEN & FAMILY ROOM. LARGE ISLAND. NEW GRANITE COUNTERTOPS. FIREPLACE IN FAMILY ROOM. EXTENSIVE LAMINATE FLOORING. HUGE BONUS ROOM 20x15.5 ADDED WITH PERMITS. GREAT FOR BILLARD ROOM. THEATRE. VAULTED CEILINGS. RECESSED LIGHTNING. SOLAR TUBE. LARGE DINING LIVING AREA. 4 BEDROOMS. LOFT AREA OR 5TH BEDROOM UPSTAIRS. LARGE MASTER WITH SUNNY DRESSING ROOM. LARGE WALK-IN. Neighborhoods: Rancho Del Rey Other Fees: 0 Sewer: Sewer Connected Topography: LL"
"Views of Coronado Islands & evening lights. Rolling Hills Ranch s most exclusive neighborhoods. Enjoy peaceful walks & views down the greenbelt to one of 5 exclusive neighborhood community pools & parks. Home features Solar Power, Electric Car Charger, Water Filtration System, Tankless Water Heater, Saltwater pool, Viking Stove, Microwave and Cooktop. Home also includes Refrigerator, Washer and Dryer. 4 Bedrooms w/Great Room upstairs & a large extended family room downstairs. No Mello Roos! Neighborhoods: Rolling Hills Ranch Complex Features: ,,,,, Equipment: Garage Door Opener,Pool/Spa/Equipment Other Fees: 0 Sewer: Sewer Connected Topography: LL"